This tutorial will require you to be able to use and code in HTML and CSS as well as to create graphics using whatever software you use to create those graphics. If you use Dreamweaver or something similar for your coding, PLEASE be sure you know how to edit that code; Dreamweaver and other similar apps put some code in that should not be used on eBay. And PLEASE, PLEASE do not use Word to create your HTML page; it puts in a lot of what is known among web designers as "crappy code"! Now, if you're not all that proficient at HTML and CSS, you will still be able to use much of this info, but just don't expect to be able to do the fancy stuff right off the bat. I consider myself quite knowledgeable at HTML and a sort of intermediate user of CSS and am often googling for info or begging for help on eBay's Photos & HTML discussion board. I ask that you do the same if/when you need answers to customizing your own eBay store; I am unable to provide free one-on-one assistance to all who contact me. There are eBay stores with more customization than this tutorial shows, but a tutorial to show you such things as how to add a background image and stylized boxes around your listings in the Gallery format in your store would require a book - or at least a large booklet. Promotion Boxes (which can be used for custom navigation on the left side of your eBay store pages, for example). The first header above is a very plain-Jane one. 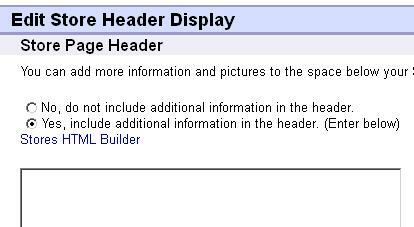 Many standard eBay store headers have the seller's logo or a graphic supplied by eBay. There are a couple things like that or a graphical background which can dress up a standard store header. The second header above is fully customized with a logo, photos, illustrative background and links which brand the second store more fully than does the first. One thing which is not added to the custom store header in this example, is what's known as the store description - the text in the standard header above which starts with "Welcome to..." This descriptive text is valuable for search engines and should include keywords which may show up in search results when shoppers seek products by type or brand name on google, bing and other search engines. 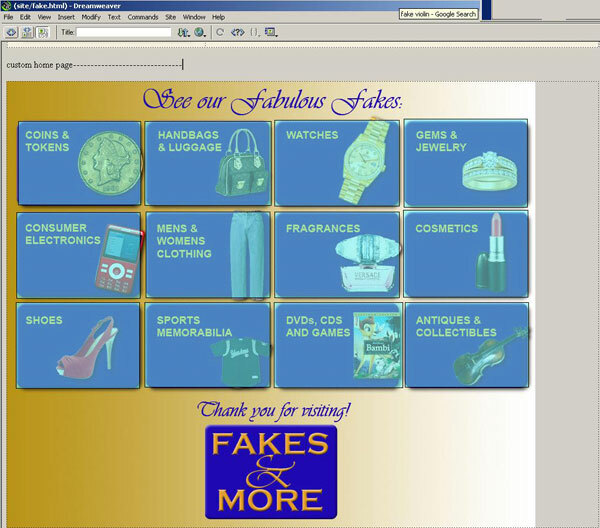 For this tutorial, we'll use a fake custom store header for a fake store called "Fakes and More". I use my own process for the steps to create your own custom store header in this tutorial - your process may differ, of course. I then draw with the marquise tool to capture each section and save it for the web as a JPG, GIF or PNG, whichever is best for the type of image it is. The above image shows 6 sections. I save the top/left section as headertl.jpg, for example and each other section as header--.jpg, with the dashes replaced by tm for top/middle, tr for top/right, bl for bottom/left, bm for bottom/middle or br for bottom/right. Although my image is 1100 pixels wide, I generally create the custom store header to extend across the browser window at 100% so there is no white space to the right of the header. Since the two right sections above can also be used for what I call a background image, I don't need to save a separate background image. If the coins had stretched to the right border, I would have hidden their layer temporarily so that I could get the unadorned background images as I need. (This "background image" will make a bit more sense shortly.) Because the bottom/middle and bottom/right images are the same (width being irrelevant in this case), I can use headerbm.jpg for the bottom/right image as well since they will both be background images. Although I know how to code HTML "by scratch", I do use Dreamweaver to create most of the eBay and web layouts I do. And - a confession - for most of my eBay design work, I don't use my CS version of Dreamweaver, but Dreamweaver 4, because it doesn't have the bells and whistles I don't need for most of my eBay work. Thus, you'll see screenshots here of that ancient version. (BTW, you can still find that version for sale on eBay and it is a nice tool. HOWEVER, if you don't understand HTML, I highly recommend (INSIST!) you spend a bit of time learning to write HTML from scratch so you can fix things in the code - and you most certainly will have to tweak things on occasion! I open a new Dreamweaver window and save it under the name header.html, for example. I immediately to to the code inspector window and delete the code Dreamweaver automatically starts with (as in image to right) as this code is not needed and should not be used for eBay headers, pages, promo boxes, templates and About Me pages. So, I next create a table which is 100% wide and has 4 columns and 2 rows. Usually, I set the table cells properties to have a top/left alignment. I place the images within their appropriate cells; if there will be text on top of the graphics, those images will be cell background images. I make sure my cells are sized to fit the images exactly. I enter the text where it belongs. 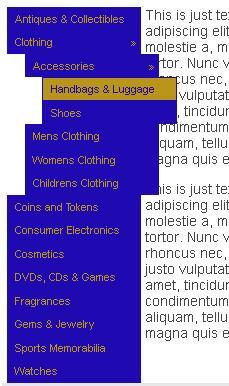 In the case of the links to the eBay store and others, I also added the CSS style code to the top of the code. I use what I've named "alinks" as the ID for my anchor links. (When you look at the source code of sallymilo.com/milo/fake.html, you'll see the styles and CSS code I used.) I used <span ID="alinks"> right before the <a href... for each link and added </span> immediately after the closing </a> tags for those links. The next CRUCIAL point is to look at the layout/design in your browsers - that's right, plural! I generally check in both Firefox and Internet Explorer 8, but will usually check in Chrome and Safari as well, though those two render HTML pages similar to how Firefox does. I recently discovered that one must also check their pages in Internet Explorer 9, which is only available in Windows 7; Microsoft has made some of its IE9 features incompatible with even IE8! **You can see this store header and view its source code - and the other samples on this page - at sallymilo.com/milo/fake.html. You will have to upload your store header graphics to a web space. If you have your own website and hosting space, you may want to upload these graphics to a directory called "eBayGraphics". Or, if you do not have a web space, get a free Photobucket.com account and upload the graphics there. (Out of a couple dozen of my clients who do use photobucket to host their eBay graphics, a couple of them have found if they don't log onto their photobucket account every few months, photobucket seems to put their graphics into a hibernation mode until they do log in to their accounts. Thus, just in case, I recommend logging onto your photobucket account every 3 months - perhaps when the seasons change. BTW, since photobucket modified its site late in 2012, the largest pixel size allowed for images is 1024. Once the graphics are uploaded, you will have to add their full URLs to the HTML code. Be sure to note the URLs for both images and background graphics. Under Theme and Display, click on the link "Change to Another Theme". On the Change Store Theme page, click on the "Easily Customizable" theme, then select "Custom Header Only" and save the settings. You'll be back at the Display Settings page now. Click on the "Change" link to the right of Store Header Display. On the new page which opens, check the Yes... box as shown below, remove anything which is in the larger box below that, then paste in your store header code. Below that box is the eBay Header Style section. If you have a Premium or Anchor store, you can select a Minimal eBay header which doesn't make it easy for shoppers to leave your store. Then, click on the Save Settings button at the bottom of this page. Custom eBay store pages are used for a variety of reasons; some to dress up the store home page, often with boxes and/or images which link to various store categories; some for navigation of the store's categories; some to feature policies, a FAQ or other information the seller would like to see. I use a few of my own available custom store pages for my store home page, my eBay design portfolio and tutorials. One good thing about custom store pages is that google and other search engines will find them, particularly if you use many keywords your potential customers may use to search with. For example, if you do a google search for eBay stores tutorial, you'll find the tutorial I produced right after a paid ad about opening an eBay store and eBay's own store info pages. Similar to the way I designed this storeheader is how I created this store home page design. In this sample, I did not "slice" this image, but you could do so if your layout calls for it, particularly if it has a large file size..
Again, I created the HTML similarly to how I did so for the store header. For this store page, however, I created a one-cell table with a 100% width and that cell has top/left properties. What else I did differently is that I created an image map for the category boxes in my design. (It is MUCH easier to create an image map with Dreamweaver or something similar than to do so from scratch!) Each box, via the image map, will link to the appropriate store category. In my sample at sallymilo.com/milo/fake.html, you'll notice the code currently links to coinsurl, for example, rather than an actual store category. If I had a coins category in my eBay store, it's URL would be something like http://stores.ebay.com/going1ncellc/_i.html?_fsub=123456789. That last number is the store category number which would be my coin category number. 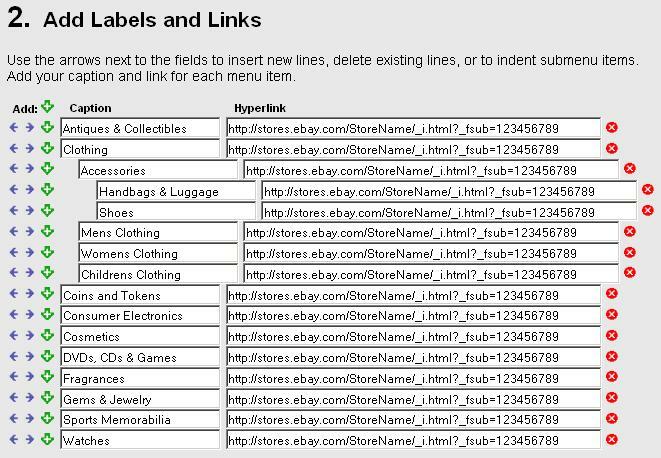 You can find out your store category numbers (and names) by signing onto eBay and going to http://cgi6.ebay.com/ws/eBayISAPI.dll?StoreAllCategories&guest=1. Using the form of the sample category URL I have above (ending with 123456789) and the category number from the above URL, you can easily figure out your store category links. If you have a way to automate such a thing (I use Excel and an ancient copy of Homesite to do some quick replacements), this will surely be less tedious than making sure you have at least one item in each of your store categories then copying and pasting each link into your home page or custom navigation! You will have to upload your store header graphics to a web space. If you have your own website and hosting space, you may want to upload these graphics to a directory called "eBayGraphics". Or, if you do not have a web space, get a free Photobucket.com account and upload the graphics there. (Out of a couple dozen of my clients who do use photobucket to host their eBay graphics, a couple of them have found if they don't log onto their photobucket account every few months, photobucket seems to put their graphics into a hibernation mode until they do log in to their accounts. Thus, just in case, I recommend logging onto your photobucket account every 3 months - perhaps when the seasons change. This code moves the whole custom store page up 31 pixels so that there is no separtation between the store header and what goes below it. In Manage My Store, go to Custom Pages. Click link to "Create New Page". Because you've created a custom page which should have all you want in it, select the 1 Text Section/HTML layout for your custom page, then click the Continue button. On the following page, name your store page title, then paste in your code into the Text Section 1 box after deleting anything which may be in it already. Select whether you want to show or hide the left navigation bar, then click Continue. This will open a preview page. If all is as expected, click on the "Save and Publish" button. If not, click the "Back" link to fix your code before trying again. You can use a promotion box to hold your custom store search and categories navigation section rather than using the standard eBay features. Please note: if you regularly have empty categories or add or delete categories, you should not have custom store categories as you'll then either frustrate shoppers who find no results when they click on an empty category or you'll have to edit your code to add or delete categories. BTW - eBay doesn't always save your custom promo box code, so make sure you save it on your own computer! In this section, I will demonstrate my process for creating custom navigation including the store search and categories to browse. Generally, I won't need much for the design as I use a simple box which may have the titles text as graphics, a GO button graphic and perhaps a background graphic or two for design purposes. But, I do usually start with laying this out in Photoshop, using the same colors as in my header and custom page. To the right is my layout in Photoshop showing guidelines so I know where I want to crop the individual pieces of the design. Now, I have to add the search code and GO button to the Search Store section, so in the table cell into which I want the search box and GO button, I insert this code, replacing "StoreName" with the real store name and "gobutton.jpg" with the GO button's file name and I replace the XXes with the height and width of the GO button. Of course, at this point I preview and test this layout in my browser to make certain the search works properly. 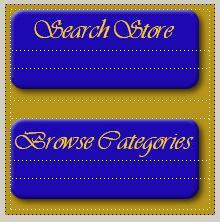 Shipscript has a tool, MenuMaker, which I used to create the menu for searching store categories. You can find it at http://www.isdntek.com/tagbot/menumaker.htm. I suspect most start at section 2, "Add Labels and Links", so that is what I'll show here. 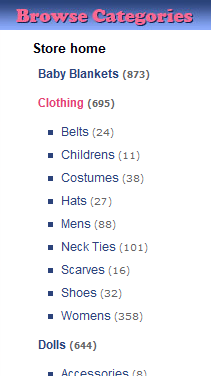 As in the image above and to the right, you'll see I have 16 categories for this fake store. You'll also notice that under Clothing are four secondary categories, with two third-level categories under accessories. I have entered as shown in the image below each category's name, indenting the second- and third-level store categories, as well as putting in their URLs (the same fake URL in appropriate format is shown in this sample) so these categories will link to the appropriate store categories. One thing I look for right off the bat is that the category names fit into the width of the menu. If not, I'll adjust in Section 3 until all levels of category names are completely visible. You will have to upload your store promo box graphics to a web space. If you have your own website and hosting space, you may want to upload these graphics to a directory called "eBayGraphics". Or, if you do not have a web space, get a free Photobucket.com account and upload the graphics there. (Out of a couple dozen of my clients who do use photobucket to host their eBay graphics, a couple of them have found if they don't log onto their photobucket account every few months, photobucket seems to put their graphics into a hibernation mode until they do log in to their accounts. Thus, just in case, I recommend logging onto your photobucket account every 3 months - perhaps when the seasons change. Once the graphics are uploaded, you will have to add their full URLs to the HTML code. Be sure to note the URLs for both images and background graphics, including such images in the CSS code, if any..
To color the store categories list, such as in image to right, you'll add some CSS to your store header code. (BTW, in this sample, we used a different shade of blue than the default one eBay used for the store category links - and, the Clothing link shows how it turns color when you hold your mouse over it.) The image to the right also shows a custom title image which replaces the default 'Store Categories' text. At most times I will have something like this on eBay, you can view the CSS of my test store to learn how I do this. This method is prefered to the custom 'Promotion Box' sample shown above. 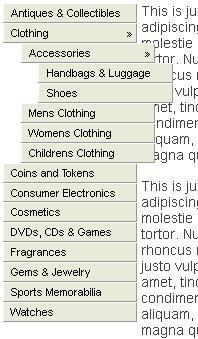 This formats the store categories list - and is dynamic. This means that only store categories which have items displayed in them appear. If you add or remove store categories, you won't have to fiddle with the code. In Manage My Store, go to Promotion Boxes. Click on the "Create New Promotion Box" button. On the page that takes you to, select the third promo box type, "Communicate to your buyers" then click the "Continue" button. On the next page, you'll select your promo box location. For custom navigation, I use "Left navigation - Upper", then click "Continue". On the next page, "Content", select the "Custom" Information type as shown below. 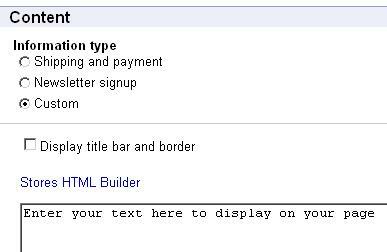 Remove the "Enter your text..." text in the box, Stores HTML Builder, and paste in your promo box code. Name your promo box at the bottom of this page, then click the "Save" button. Go to Display Settings in Manage My Store. To the right of "Left Navigation Bar Settings", click on the "Change" link. Un-check the 4 boxes on the resulting page, then click the "Save Settings" button. Confirm the left side of your store appears as it should. You now should have a fully-customized eBay store home page! If you want your listings to appear beneath your custom home page or want to have a promotion box appear within that custom page (or a few other options), please see eBay's Special Stores HTML Tags - special tags you can add to your eBay store pages to display various things. (eBay.com no longer has the page up, this is the UK page; tags work on .com. )This has some eBay-stores-only code which you can use. Just be careful: if you use the double quotes (") mark for that code, make sure your code is actually shows double quotes rather than the HTML code &quot; - or you'll go crazy trying to figure out why the feature you expect is not displaying. Please, if/when you do use the above information to create your own custom store home page (even if you're a fellow designer! ), send me a link so I can see your results! - Sally@SallyMilo.com.